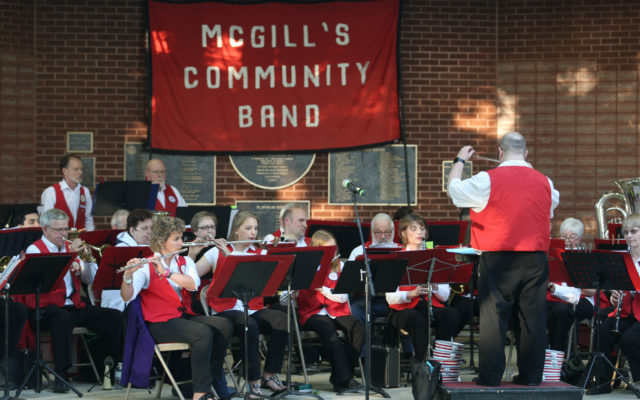 Another sure sign that summer is just around the corner takes place Thursday evening as McGill’s Community Band returns for its first concert of the season. HOULTON, Maine — Another sure sign that summer is just around the corner takes place Thursday evening as McGill’s Community Band returns for its first concert of the season. For 32 years, McGill’s Community Band has entertained audiences throughout the summer at Houlton’s Monument Park with the sounds of big band favorites, contemporary pieces and timeless classics. Kevin Mania returns as the band’s conductor for his fourth season. McGill’s Community Band of Houlton was organized in 1985 as the fulfillment of David McGillicuddy’s dream. McGillicuddy, the then-band instructor for SAD 29, dreamt of resurrecting a local community band concept with membership comprised of local musicians who would perform in Monument Park on nice summer evenings as had been done in days past by the Houlton Town Band. The first band was formed that year with 55 members. Membership in the band, at one point topped 100 players. The nearly 60 current members are a variety of younger and older players.